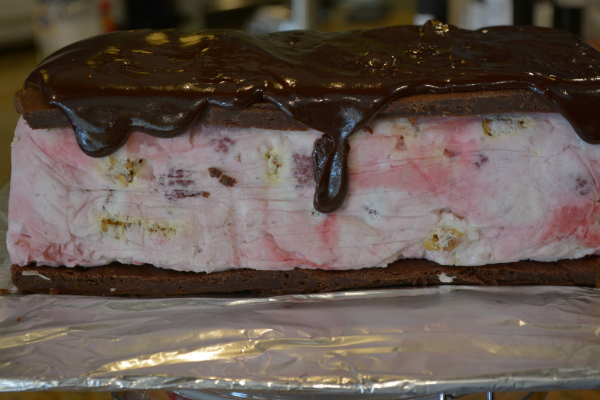 With Passover coming up soon, I was inspired to create a recipe dairy-free, kosher for Passover, raspberry flavored version of a Semifreddo with lots of chocolate. 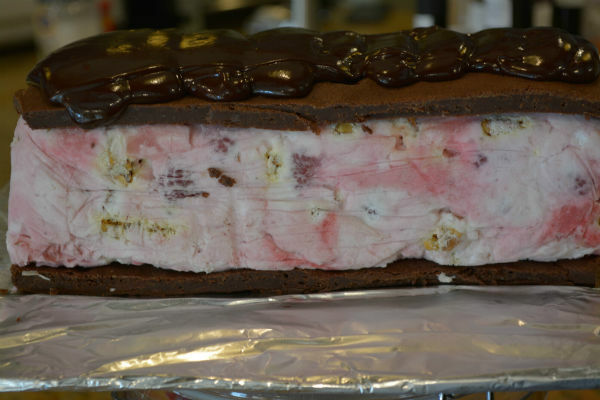 Semifreddo is an Italian dessert concept usually involving some frozen cream, ice cream and or cake. I have to say the first one I ever had was a tangerine version and the delight I took in eating it stuck with me for a long time. 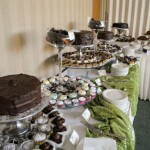 I will also serve a lot of nut cookies and a Pavlova and fruit and just maybe berry crisp with my kosher for Passover special crisp topping I dreamed up a couple of years ago. I filled two loaf pans, 10 x 3 x 4 inches or you could use two medium size pans. 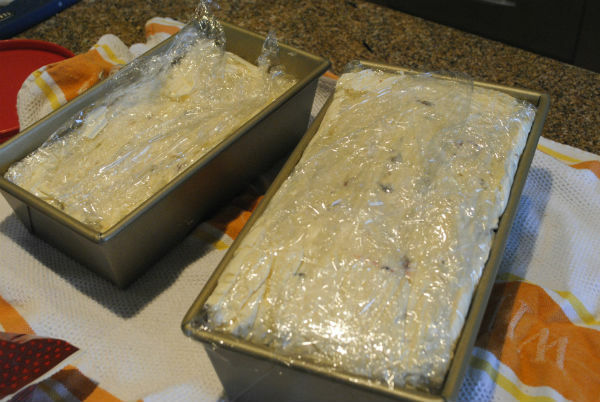 Line the loaf pans with plastic wrap going both directions and overhanging the pan by about 5 inches on each side. 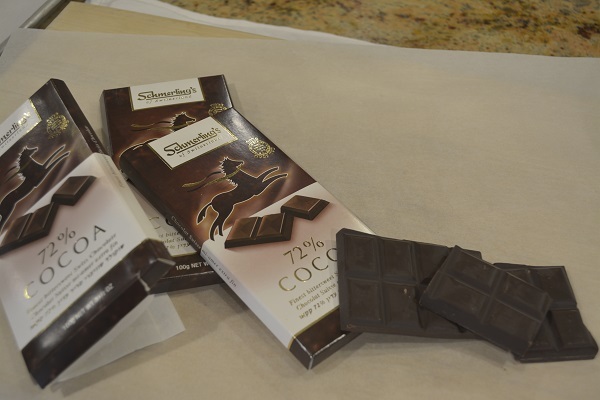 The overhang will be used to wrap the semifreddo and when you unwrap the overhang it makes it easy to pull the semifreddo out of the pan to slice and serve. 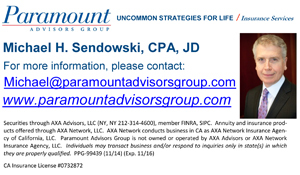 This needs to be frozen for 8 hours or overnight before proceeding with the assembly. 2 cups fresh raspberry puree (smash fresh raspberries through a sieve to remove seeds and just leave thick pulp. 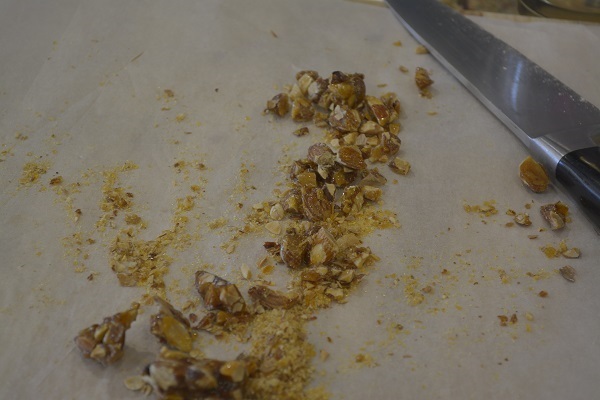 For almond brittle, heat oven to 350° F. Spread almonds on a rimmed baking sheet and toast for 7-10 minutes. Almonds burn very fast, so don’t walk away. Turn off oven and leave almonds in the oven for another 10 minutes. Remove almonds from oven and let them cool off. Almonds can be stored in an airtight container once cooled and this step can be done even a week ahead. Make sugar syrup. Place sugar and water in a small heavy bottomed saucepan. Place pan on medium-high heat and watch as sugar melts and turns to a golden amber color. You may swirl pan but do not stir. The moment the right color is achieved, stir in toasted almonds. Stir almonds and caramelized sugar to coat all and pour brittle out onto silpat lined baking sheet. Spread it out fast, thin as you can, since it sets up very quickly. Do not touch with fingers this burns. Set aside to cool. When it is completely cool, chop brittle into coarse chunks. 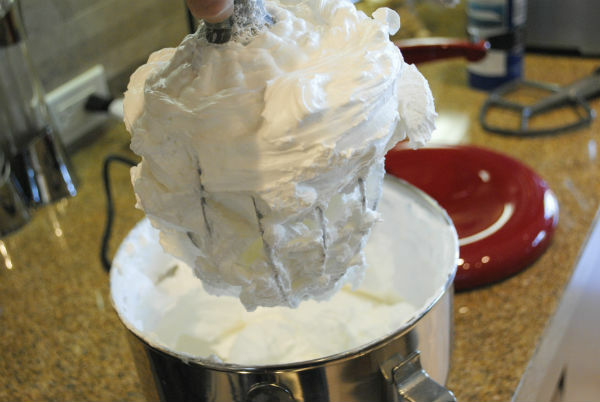 For meringue, set egg whites and salt in bowl of a stand mixer with a balloon whisk ready to whip. 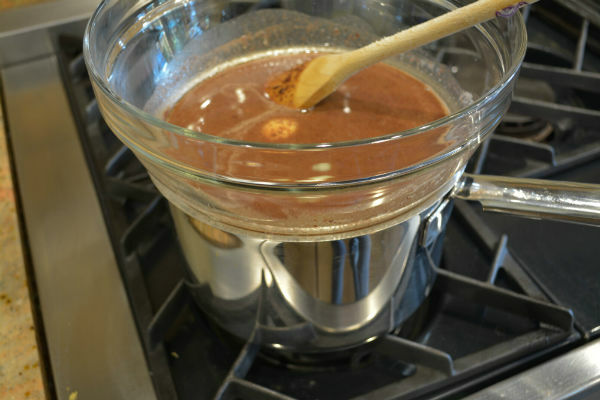 For syrup, place 1 and 1/ 4 cups sugar in a heavy bottomed small saucepan with water. Melt sugar and water then, bring sugar to a boil, without stirring. Cook until temperature reaches 238° F on a candy thermometer. The sugar will not turn color this time. When sugar begins to melt, begin whipping egg whites until soft peaks form. Sugar syrup reaches 238° very rapidly. As soon as sugar comes to the right temperature remove saucepan from heat and carefully pour in a slow steady stream into beating egg whites from as high up as you can aim and hold pan. Egg whites will instantly become glossy and stiffen. Continue to beat egg whites on high until they cool off or about 5 more minutes, set aside. Whip non-dairy topping until stiff. Add in sugar and beat for a second more. Place meringue in a large bowl; fold in 1 cup of whipped topping to loosen. Add almond brittle, raspberry puree, and the rest of whipped topping. 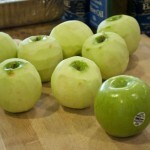 Fold together using a large spatula, gently reaching all the way under and giving a turn. Try to minimize deflating the meringue. 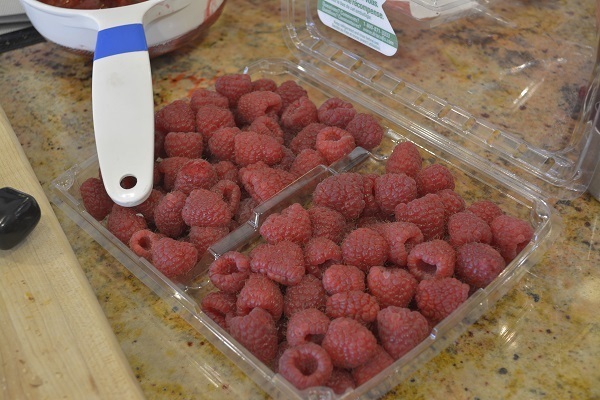 Lastly, add fresh or frozen raspberries and gently spoon semifreddo mix into prepared loaf pans. Bring up sides of plastic wrap to seal. 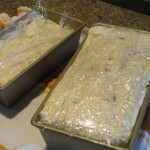 Place loaf pans in freezer until ready for next step. 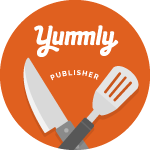 Make two recipe of Passover Individual Brownies and instead of making them in muffin tins Pour batter into two parchment lined rimmed baking sheets. Bake for about 10 minutes, remove from oven and cool. Wrap baking sheets in foil when cool and freeze. 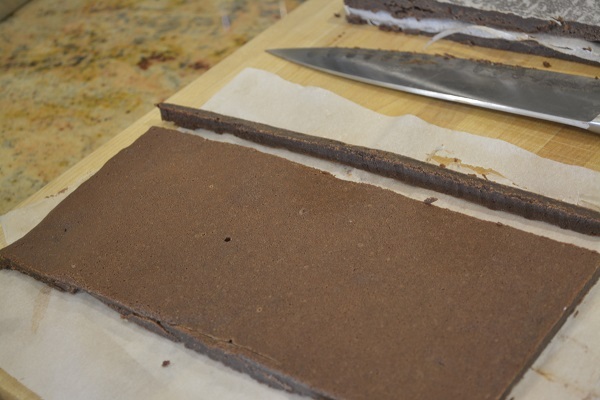 Remove brownie sheet pans from freezer, invert onto cutting board and peel off parchment paper. 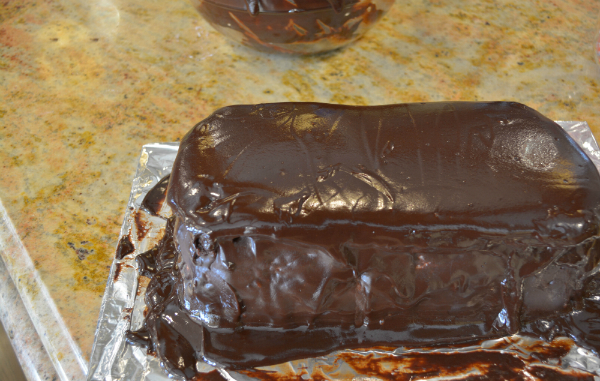 Measure loaf pan used to mold Semifreddo and cut two chocolate brownie rectangles to fit. Prepare 2 foil wrapped pieces of cardboard larger than the loaf pans. 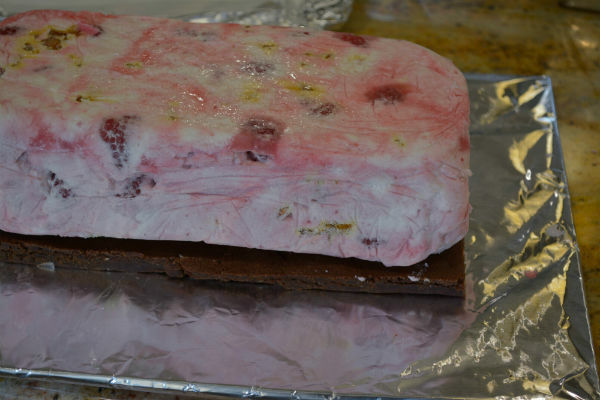 Remove first Semifreddo from freezer, unmold with plastic wrap still on. Carefully unwrap one . 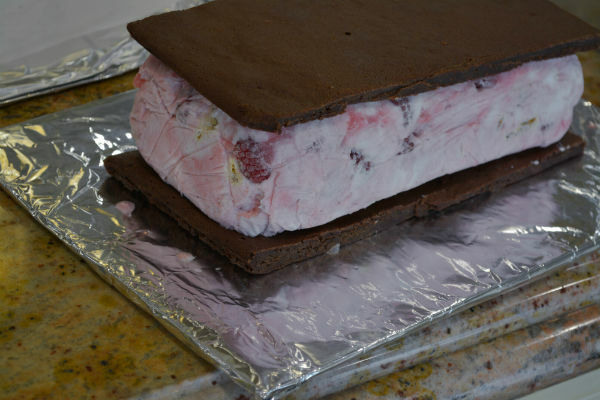 Place brownie rectangle on prepared cardboard, and place Semifreddo on top of brownie and cover with another brownie rectangle. Return to freezer as Semifreddo melts quickly. You can wrap in plastic later after it gets hard again. Repeat for second loaf. After several hours or several days you may glaze and cover. Prepare a double boiler. 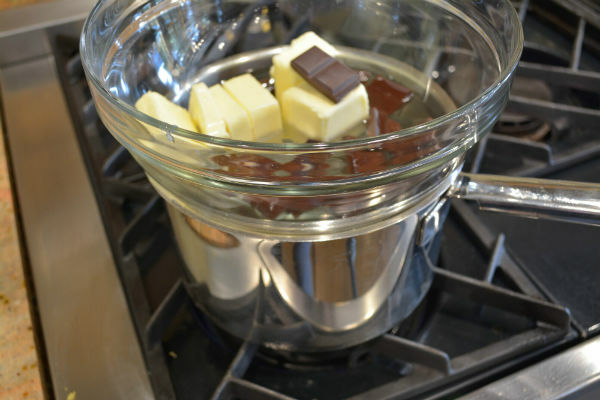 Heat chocolate, water, margarine, and oil in top of double boiler (I use a glass dish over a saucepan). Stir all until melted together. It will not look smooth or shiny. Remove bowl from double boiler and place on counter. 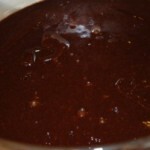 Combine cocoa powder and sugar and pour into bowl of melted chocolate. 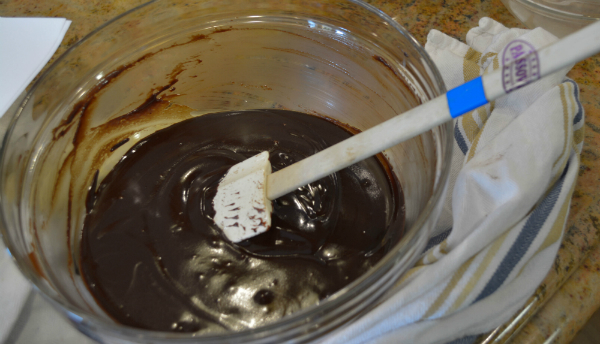 Stir until sugar dissolves and glaze is smooth and shiny. Let glaze cool until thickened slightly but still pourable. Pour glaze over top and try to get sides, smooth sides quickly. Place Semifreddo back in the freezer to set up. To serve cover in whole fresh raspberries, slice like banana cake or pound cake and garnish with more whipped topping or raspberry puree. Two loaves for two Seders!! or a big crowd.